…It is not because one wears makeup and a forelock is to be seen, that one makes a political stand. It is not because that one revels in big words on freedom and democracy that one knows the limits and burdens of collective and individual responsibilities. It is not by playing hip-hop music in the living room that one is a democrat, a freedom fighter. That moron president, Ahmadinejad, made the praising headlines of Iranian papers, in 2008: We have evidence that the United States wants to prevent the advent of the Mehdi (the Messiah). Religious folly and fanaticism lead to early senile dementia. Ahmadinejâd was re-named in 2009. Hassan Rouhani came after in 2013 to change things. Did nothing in his first term, but he was re-confirmed by the voters or so we are told. In his latest speech to the Parliament, 14 August 2017, he said:I really wanted to introduce three women in the 12th government as a minister, I also considered to have some names. But it did not happen. Inshalah, some other times. Why did it not happen? Give us a raison, if you have one. Iran is run by a Mehdi and many Inshalah. Every four years, since 1980, the Iranian presidential elections take place. In the early days of the Islamic Republic, the process was not well understood. 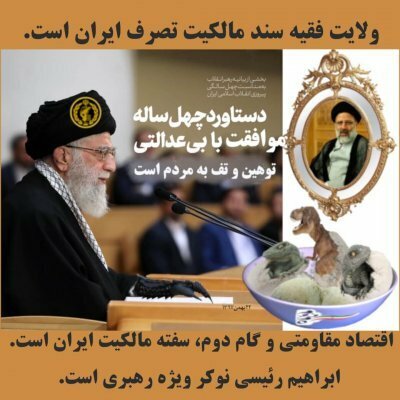 In Iranian politics, despots are a natural phenomenon; there was already a non-elected “Supreme Leader” in charge with all the powers of the State, so why bother to elect an ineffective president of the Republic by universal suffrage? And why, after the elections, have an even more useless prime minister named? An impeachment (Banisadre in 1981) and an assassination (Radjai in the same year) did not bring a clear answer. However, the redundant function of prime minister was later deleted from politics, and rigged elections at all levels set out the blueprint of Iranian politics. There was one boss: the Supreme Leader, an infallible sanctified figure tucked away in inner cycles; there was his temporal puppet, a president good enough to take all the blame for the failures and face the outer world. Supertitions and lunacies are part and parcel of political Islam. Good Luck Iran with the next the confidence tricksters as president. Another will say the world is flat, that the moon is made of green cheese and that pigs can fly. And we will be asked to vote for him. We will do, Inshalah things may change, Or may not.